The church meets in a warehouse. 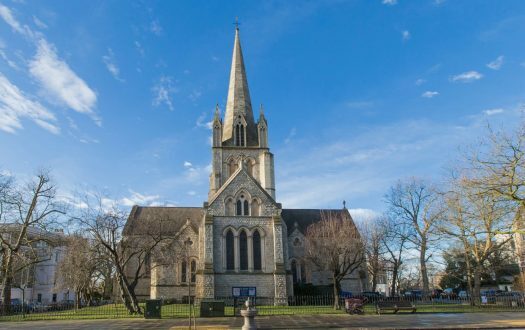 From the outside, it is the aesthetic antithesis to many of the great church buildings and cathedrals that may be found around London. That is to say, it appears to be little more than a large box behind a security gate. As I entered the church, the first thing that hit me was the darkness. 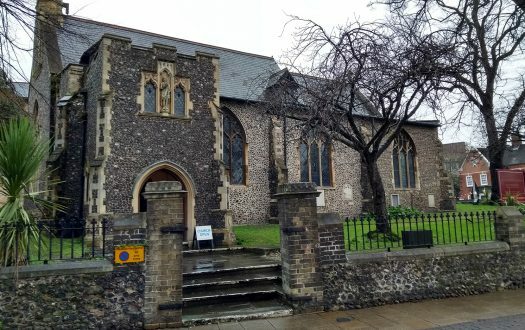 As it was a relatively sunny day, my eyes had difficulty getting accustomed to the gloom that the inside of the church was shrouded in. That said, it was far from drab. There were a number of tables, chairs and sofas dotted around, behind which was a giant, thin black curtain. Behind this curtain was the main auditorium, which bore a strong resemblance to a concert venue, with rows of seating all pointed at an elevated stage. The seating area was mostly in darkness, with only a few lights that seemed more for decoration than illumination. The stage, however, was well lit, ensuring that the congregation had a better view of the worship leaders than of the person sat next to you. The whole place was step-free, so would be readily accessible for wheelchair users, though the dark atmosphere may not be helpful for those with poor vision. 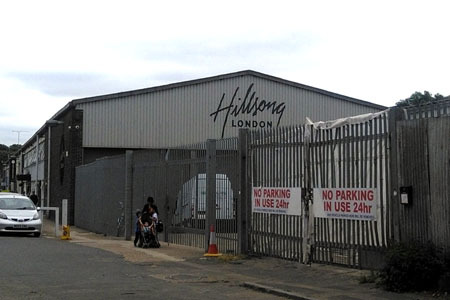 Hillsong first came to London in 1992, under the name of London Christian Life Centre. It was rebranded as Hillsong in 1999. This particular church is one of several subsequent church plants. The warehouse in Bermondsey was first leased in 2013, with services starting the following year. 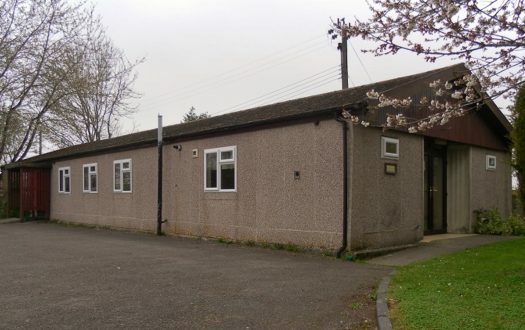 They currently run three services a day and have a number of ministries, catering to different age groups up to the age of 30. For those who have recently become Christians, they run an event called "I have decided" to help people learn more about the decision theyve made. Situated on an industrial estate between two refuse centres, the place reeked of a distinctively unpleasant odour. Apart from the factories, car washes and tips, the area has a high concentration of Pentecostal churches of one kind or another. Opposite the church is a large football ground. The service was led by the Bermondsey pastor, Phil Kyei. The sermon was given by Cathy Clarke, the lead pastor of Hillsong London. There was barely a spare seat in the place. I would estimate there were around 600-700 people present. With such a large congregation, though, my margin of error may be quite high. Perhaps most noticeable was the age demographic; I would have a guess that at least three-quarters of the church were under the age of 35. Coming down the road, with the warehouse in sight, I saw several people with large boards bearing messages such as "So glad you've come" and "Welcome home." Several smiled and gave a perfunctory greeting, but no one attempted a personal welcome or to engage me in conversation. Nor did anyone speak to me after I took my seat, though I did notice one person who seemed to be scanning around for newcomers and made an effort to speak to them. I seemed to have escaped her notice. Much of the service was spent standing, though as latecomers came in and tried to squeeze past, it became apparent that the rows were a bit too close together for comfort. I nearly fell over trying to accommodate people. When we did eventually sit down, the seats weren't all that comfortable. They were plastic fold-down chairs. As they weren't connected, I couldn't help but wonder whether they were in breach of fire safety regulations. It was noisy and busy. I think I came in just as the 9.00am service was turning out, so there was quite a flux of people about. In order to talk, people had to shout over the music, which was being piped through the PA system at an unnecessarily loud volume. It could be described as soul music with a bit of R&B in it, but leaning more towards the easy listening side of things, rather than being a club atmosphere. They were completely garbled and incomprehensible, as the band were still playing, with the music drowning out the speech. The first intelligible words I made out, some 20 minutes into the service, were "We're going to play a new song, so lean in." There were no books in use here. On each seat we had a couple of sheets of paper. One was a sheet entitled "New to Church?" which asks for you to fill in your name, e-mail address, date of birth and phone number. The other was an envelope called "My Giving" which contained a small pen and asked for various financial details, including instructions for setting up a standing order. The words to the songs were projected on a giant screen at the back of the stage. There were very few references to scripture in the entire service, and any that were there tended to come as isolated verses, used without context. The only time a particular version was referenced, it was to the Amplified Bible, which (Wikipedia tells me) "is designed to 'amplify' the text by using additional wording and a system of punctuation and other typographical features to bring out all shades of meaning present in the original texts." There was a full band, with keyboard, two electric guitars, a bass guitar, and drums. They were assisted by several singers who also jumped around and danced on stage. It would be hard not to be distracted by the razzmatazz that was going on. The images on the giant screen were constantly on the move. Even when song lyrics were being displayed, there was always something going on behind, whether it be flashes, drone flights over landscapes, or computer generated images of a person disintegrating into shards. Given the high noise level from the speakers, one could not help but reflect on how different this was from the idea of the still, small voice. This was big, loud, brash and professionally slick. Every part of the service seemed planned down to the minutiae. The bulk of the worship was sung, led by the band on stage, with a series of modern, upbeat worship songs based around simple lyrics of adoration. These were blasted out of the PA system at a level that made my ears ring. This was accompanied by a light show, with various coloured spotlights moving around, selectively lighting up the darkness that was the hallmark of the warehouse. There seemed to have been many prayer requests received, and these were flashed up on screen, with Phil reading out a selection of them. But the prayers werent dwelt on  it felt rushed as if they wanted instead to get on with talking about the forthcoming Hillsong conference. 5 – Cathy spoke with a soft Australian accent, often reading directly from notes. She said that she didn't like preaching. She did so competently, though with an evident nervous excitement. She was thin on her use of scripture and thinner still on theology. She also used a few anecdotes that seemed wholly unrelated to the topic at hand. One was her first hand account of her being ejected from centre court at Wimbledon the day before, having been given some tickets for the ladies' singles final that were not quite legitimate. Following that came another, longer anecdote about someone who had been on a bus that was attacked by ISIS, but where there'd been a miracle intervention by an unknown Middle Eastern figure who later turned out to be Jesus. We were also told of a new Hillsong church in Milan that had opened on Thursday, where a hall for 550 people had been hired and they had to turn away 200. To be welcoming, we have to bring people to church, which is far easier if we are active participants in the local community. Noisy environments are usually good, because that is an indication that it is a place of connection. The church should be a home for people and it's important that a welcome home should be attractive. It should speak to the future and it should offer light. The world is aching for the light that the Church has to offer. We were left with a challenge to take a risk of faith and see what happens. It was really encouraging to see so many people so engaged in heartfelt, passionate worship. There is much moaning in the Church about so-called millennials, as though they are a problem to be solved. But here there was no problem; they just were being church. I was also quite fond of the leather sofas and wingback chairs. If this kind of loud, stage-managed style of worship is not your kind of thing, you will likely have hated the whole service. It is a very different expression of Christianity to something like choral evensong. For me, the drums were so strong that I could feel a reverberation in my ribcage. It's something I'm used to from rock concerts, which I go to occasionally, but I don't think I'd want that every Sunday. It's not a pleasant feeling. I remained in my seat for a few minutes, but everyone got up and moved over to one side or left the building. I wandered around for a few minutes before grabbing a coffee. I stood by myself, waiting for someone to come over and talk to me, but nobody did. I made way over to an area that was marked "Engage," which was supposed to be a welcoming point for newcomers. I sat on one of the rather nice Chesterfield sofas, but still no one approached me or said so much as "hello." People all around me greeted one another and enjoyed the company of friends they knew, but the stranger in their midst went unnoticed. After 25 minutes, feeling rather lonely in the crowd, I made my way out. Given the number of people around, I was surprised that the area where coffee was being served was so deserted. Upon reaching the coffee bar, though, I found they were charging 2 per cup. They asked if I was new, and when I said I was, they waived the charge. Coffee was served piping hot in a polystyrene cup. Just after I received the cup, a device on the counter starting spraying water at me for some unknown reason. When I eventually drank the coffee, it was clear that the water had been overheated, burning the coffee and making it a quite unpleasant experience. I think that the combination of the high price and low quality may explain why the queue at the coffee bar was so short. 4 – I had been minded to give a 6, but the lack of any welcome after the service, particularly given the message, was quite disheartening. It was certainly an experience, but I'm not sure it's one I could face week in, week out. It clearly appeals to a young demographic, drawing people in by the hundreds from miles around. But Hillsong is a marmite church and I didn't love it. I wish it did, but sadly not. The yawning chasm between the preaching of how to welcome someone and how it was actually implemented.